Yes, by popular request the monthly pub night is back for a second year in Thurleigh. As the event was so successful last year the village hall committee have decided to make it a fixture again in 2019. 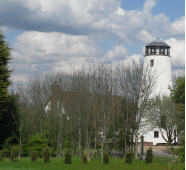 The aim of the event is to provide a meeting place for folk to socialise with friends and neighbours. Often this results in new friendships being formed and it’s definitely a place where new villagers are welcomed. The first night was on Friday 15	th February which saw a good number of people meeting to enjoy the real ales, especially the barrel of Hornes’ Dark Fox bitter, a selection of gins, Prosecco and soft drinks to name some of the choices available. There was a real buzz of conversations as news and views were exchanged. If you have been before do join us again this year and if you have never visited then please do. The pub is open from 7-11pm on the third Friday of each month so put the date in your electronic diaries and write it on your calendars so that you have a ready reminder. 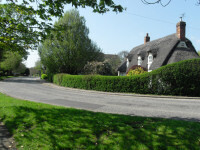 Usually the sign is displayed on the village notice board during the week of the pub, adverts are posted on Facebook and in 'The Villager' magazine and often flyers are delivered. However, all this organisation and setting up depends on volunteers before, during and after the event. The management committee is few in numbers and relies on the contribution of other people who generously give up their time to help. Thanks to those who stay to put the tables away at the end of the evening. It’s a great help. If you would like to give some of your time regularly or occasionally, especially to serve on the bar, help clear glasses and fill the glass washer or deliver flyers then please contact the chairman, Richard Singleton on 771952, randlsingleton@tiscali.co.uk	or Joan Clark on 771415. PS If you are a real ale drinker don’t arrive too late into the evening and be disappointed when you find the barrel of guest beer has run out! Two or Three Hours to Spare? In St Peter's churchyard there is a community memorial garden, which belongs to everyone who lives in the village. It is a peaceful place to sit and contemplate. Over the years it has been maintained by a small group of volunteers. However, some of them are no longer able to help and the hot weather has taken its toll on some of the plants. We need an injection of renewed enthusiasm to weed, prune, trim and plant. Generally the group meets on the first Wednesday of the month between 9am -12 noon. People come along for part or all of the time and bring their own tools but spares are available. Thurleigh stands on a 250ft high plateau, said to be the largest in England. The parish consists of about 3,400 acres of clay soil. About 750 people live in the village in about 250 dwellings. The village is spread across 5 ends - Church End, Cross End, Scald End, Backnoe End and Park End - that cover an area of about 6 square miles. 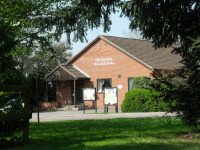 Community life continues to thrive with regular events held at the Village Hall, the Church, the Playing Field Club and the (soon to reopen) Jackal Public House. Your Thurleigh Business / Club / Association not listed? 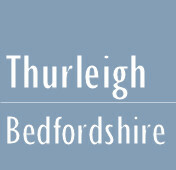 If you run a business, club or association from the parish of Thurleigh it can be included on this site for free.